Get away from it all at this charming one level home. Situated on Oak Island Drive, nestled in the trees on a corner lot, '4 All Seasons' is centrally located yet tucked away from the hustle and bustle. 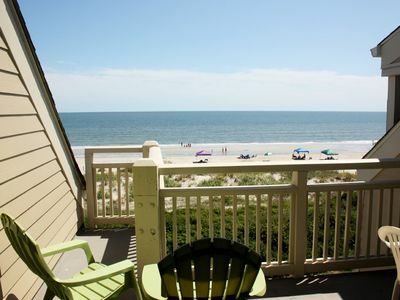 In just six to eight blocks, you'll be at a beautiful stretch of sandy beach. 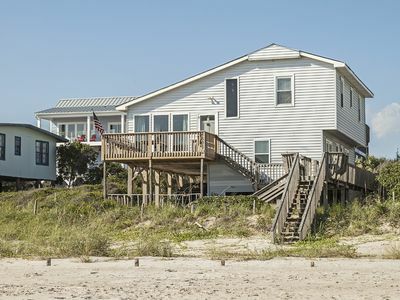 Not quite in sight of the ocean, yet easily within earshot, you'll want to sit back, relax and take it easy in the rockers on either the covered front porch or the screened in back porch. 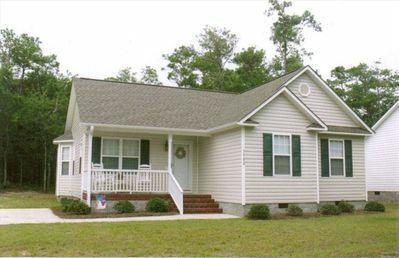 Built in 2003, this comfortable home features like new furniture and decor. Centrally heated and cooled, you will enjoy the openness and natural light in the living and dining room with the double windows and bay window. 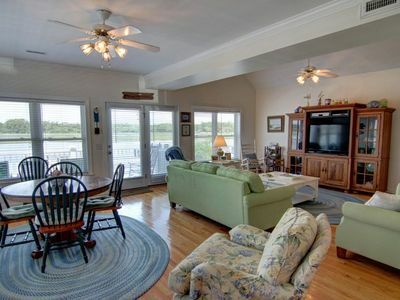 Just turn on the ceiling fan and relax in front of the color cable television (with DVD/VHS), read a good book while resting in the recliner or play a board game provided. Keep in touch with family and friends on the wireless high speed internet. Or, if you must, take care of a little business. Just remember, the reason you are here is to relax, relax, relax! The kitchen is well equipped and conveniently laid out for ease of preparation. It features ceramic tile floors and all the necessary appliances to create an unforgettable family meal. The dining room, decorated with a shell theme, features a rattan glass top table with seating for six. theme and has a walk-in closet. Relax or take a nap under the ceiling fan. Wake up to the sounds of your favorite CD on the CD/radio alarm clock. The master bath features a garden tub and window to let in the morning sun. The second bedroom features a white bead-board bed with a matching chest-of-drawers. It is decorated with nautical theme complete with a surfboard floor lamp and ceiling fan. A perfect retreat for children, this room has a trundle bed and cable television with DVD/VHS. The third bedroom is decorated with a sea life theme. The off-white wicker furniture features a queen bed and a matching chest-of-drawers. Relax as the ceiling fan cools you down. The second bath is brightly decorated in a beach motif and features a long window over the shower to bring in the natural light. Once the day is done, wash the sand from your clothes in the washer and dryer located in the laundry room where you will also find in the cabinets many DVD’s, VHS, books, magazines and puzzles. 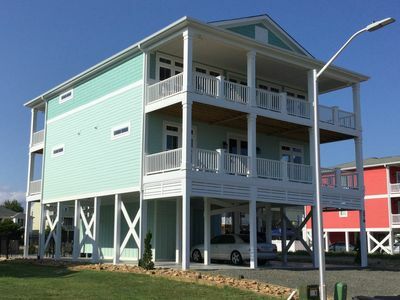 By the way, don't miss out on eating out on the deck complete with a seven-piece dining set. While located on the main road, the double paved drive is conveniently located on the side of the house for ease of entry and exit. 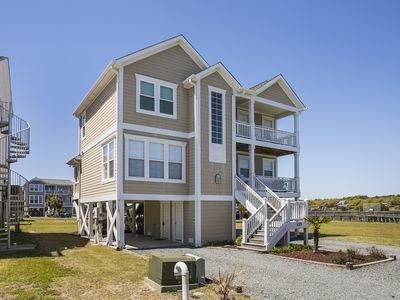 Just minutes away you will find convenient public parking at several beach access areas. The family friendly beach has no high rises, few condos and limited commercial areas. 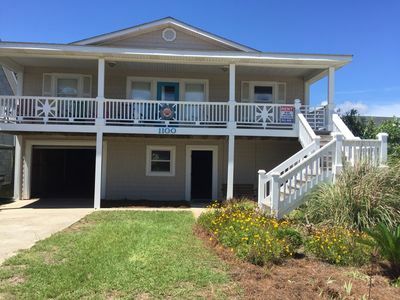 Enjoy a relaxing walk, jog, bike ride, miniature golf, boating, fishing from one of the two piers, experience skydiving at the local airport, or simply catch up on your reading or work on your tan. 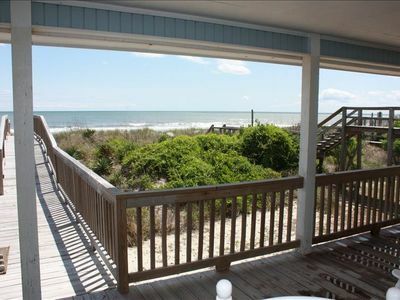 Since Oak Island is a south facing beach, you can enjoy both the sunrise and the sunset over the ocean. A favorite place to enjoy either is from one of the piers sitting comfortable on a bench. 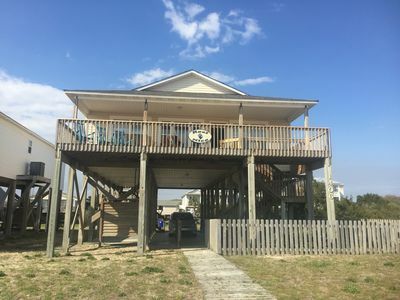 Nearby restaurants abound, but for those desiring to have a home cooked meal you will find most everything you will need at Food Lion on the island or Lowe’s Food or Wal-Mart on the mainland. Getting that special ice cream at the Dairy Queen will be a great treat! Other things that may interest you on the island are numerous churches, parks, and recreation center. 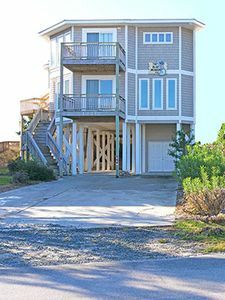 You will also find a lighthouse, Coast Guard Station, public golf course, tennis courts and a variety of interesting shops. 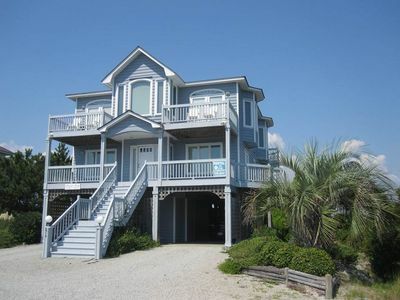 There are a lot of beach rental places for a wide variety of excursions. You can also book a deep sea fishing trip. Just 7 miles away is the quaint town of Southport where movies are made and ghost walks are exciting. Known for their many antique shops and rich history exploring the city is packed with fun and adventure. 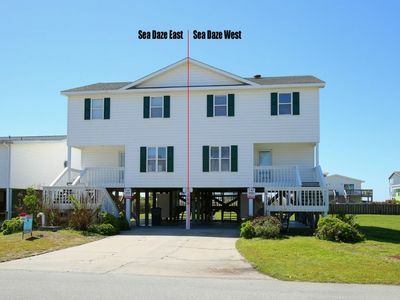 A movie theater is located between Oak Island and Southport. For those of you loving a good yard sale, much pleasure awaits you! You don’t even have to get a newspaper, since only one main road serves the main island and one the ocean front, just look for the many signs. You’ll also find treasures at the many thrift stores in the area. 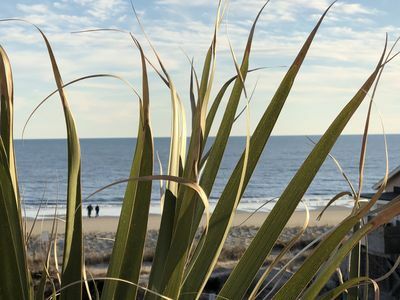 Enjoy a great day trip to Bald Head Island, the Wilmington, Carolina, Kure beaches or Fort Fisher by ferry. The ferry trip alone is a great experience, especially for children, as they feed the seagulls and feel the wind in their face. 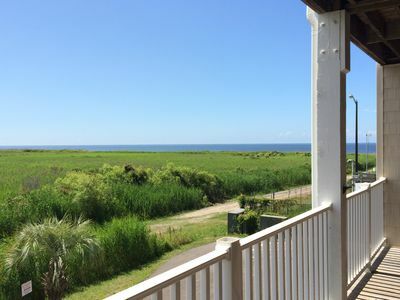 While at Fort Fisher you can explore the museum and battlefield and make memories having a picnic lunch under the Yaupon trees overlooking the beach. Many enjoy the education opportunity at the North Carolina Aquarium at Fort Fisher. So pack your bags and leave your worries behind to enjoy the comforts of home at this charming home '4 All Seasons'. 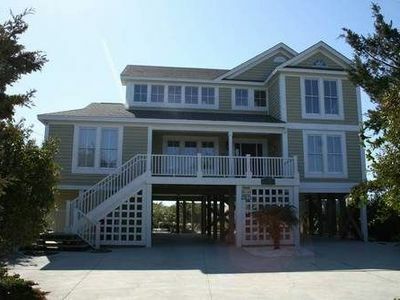 Just like the name indicates, this home is perfect for any time of the year. 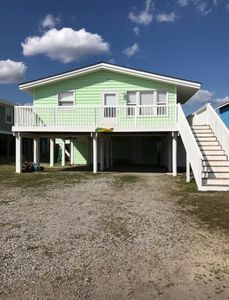 Keywords: This comfortable, clean, tastefully decorated home is a great little get-away for a week or a few days at any time of the year. Thus the name 4 All Seasons. 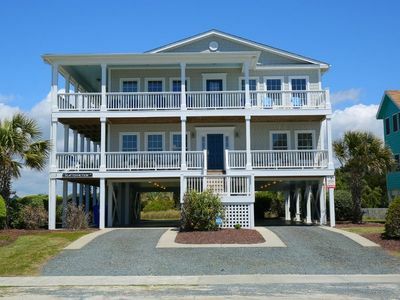 Convenient to the beach, restaurants, fishing piers, a light house and much more. A place for rest and relaxation with many opportunities for activities and day trips. Kick off your shoes and make yourself at home without breaking the bank. Rockers await you on the front porch and screened in back porch. Non-smokers, minimum 25 years of age to rent, No Pets, departure cleaning service optional. No linens provided. 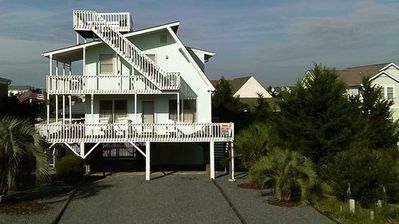 Reel Nice: 2nd Row Gem, Beach View from Balcony! 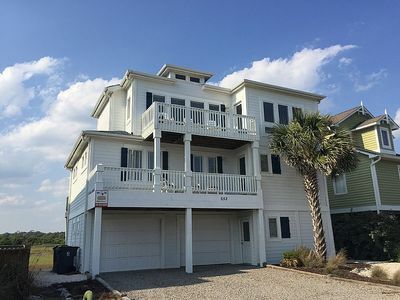 BRAND NEW listing with PROACTIVE Vacations, "A Blue Monkey" is a newly reconfigured & updated Ocean Front Home in the exclusive gated community of Holden Beach West. UPDATED PHOTOS COMING SOON! 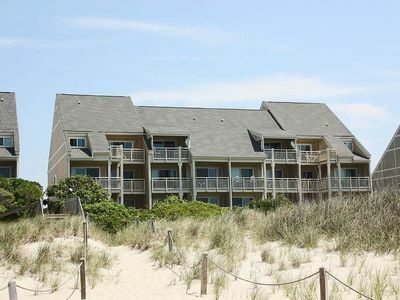 Wonderful Ocean Views - Dune Duplex! 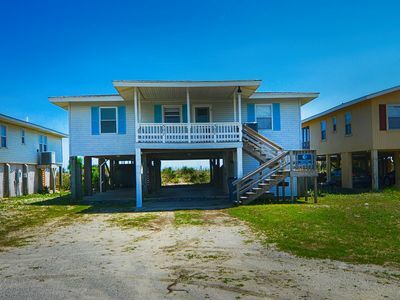 Gorgeous Ocean Views & Private Pool!